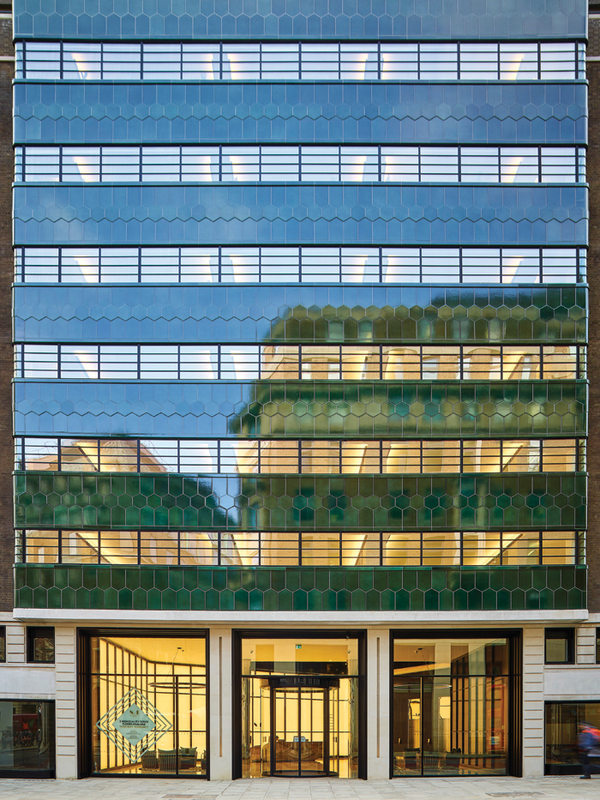 Design and architecture studio Orms has delivered the refurbishment and extension of Thirties’ office block Commonwealth House in London. 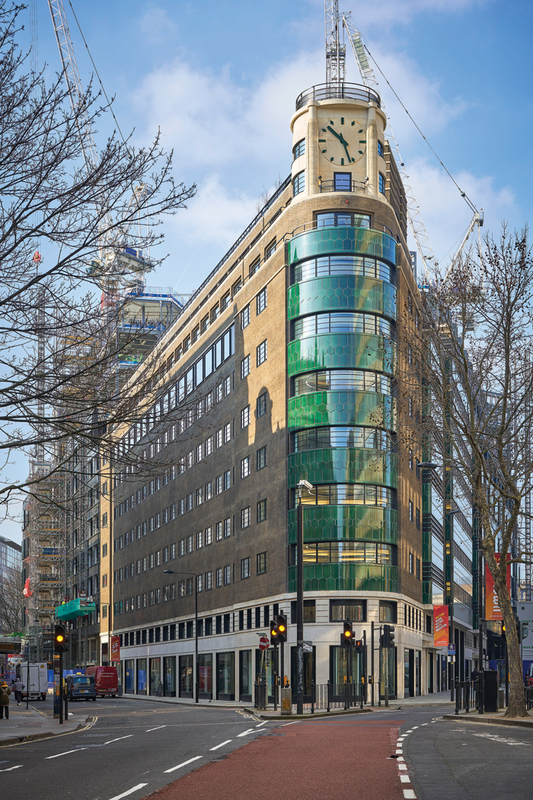 Originally designed by architect and planner Henry Philip Cart De Lafontaine, the building boasts both art-deco and art-moderne features and a nine-storey clock tower on top of its prow on the junction of New Oxford Street and High Holborn. Orms set out to restore the building as first envisaged by Cart de Lafontaine, looking at the architect’s original drawings, his correspondence and old photographs. While Cart de Lafontaine proposed using hexagonal glazed green tiles on the outside of the building, these were not permitted by the adviser to the Crown at the time, Giles Gilbert Scott, who considered the tiles ‘an innovation’. Pre-cast stone was used instead on the building, which opened in 1939. The challenge for the architects was to transform what was seen as a heavily compromised office building with numerous columns and low ceilings into an open, modern workspace. 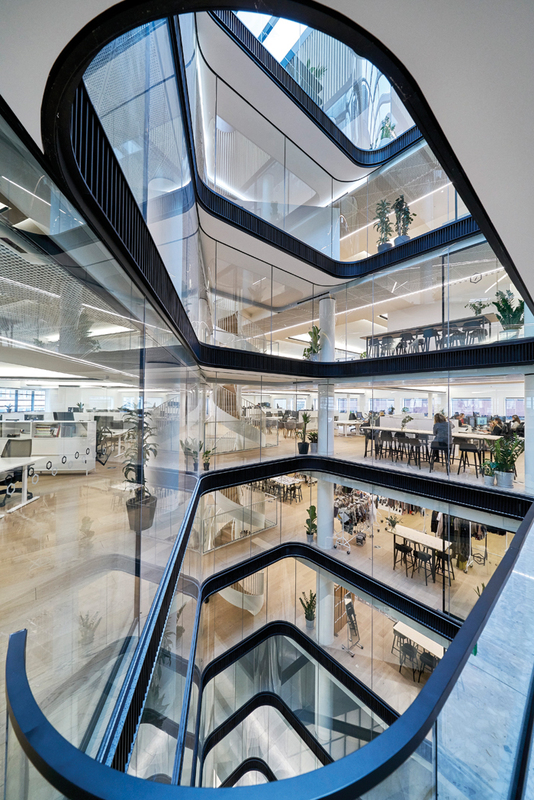 ‘Our key challenge was to create a Grade A office building that would attract emerging SME creative and technology-led occupiers and provide clean, open, connected floorplates that were air-conditioned, with flexibility for sub-division, spaces with character and meet a ration of one person: 8 sq m occupancy,’ says McRae. He adds that the construction done as part of the redesign took on the dimensions of ‘open-heart surgery’, including removing and rebuilding floors, strengthening the building structure to accommodate new floor loadings and eliminating internal columns. The point of the building is now in green tiles, as originally proposed. Photography: Timothy Soar. Orms also built up the oriel windows above the original entrances, lengthened the clock tower – adding handrails along the way – and designed a central atrium with a new bank of lifts so that a new office entrance could be created, freeing up the remainder of the ground floor for potential retail occupants. The new double-height entrance was created between the two original entrances, using the old lightwell as a starting point. Previously, a bricked-up triangle in the middle of the building that used to go all the way down to the basement level, it is now a glazed atrium, bringing in more light and providing views across all floors. 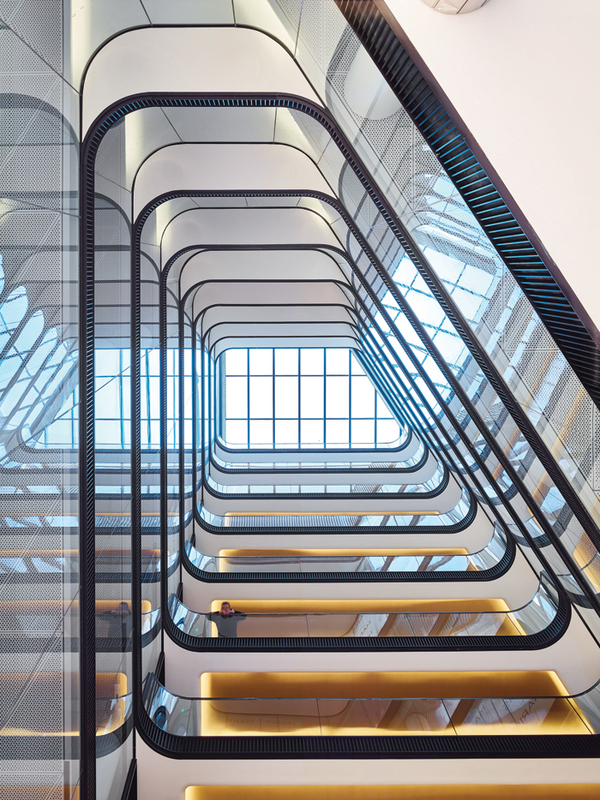 Inspired by the art-moderne style and referencing the building’s bay windows and balustrades, the atrium glazing has curved ends and strong horizontal banding. 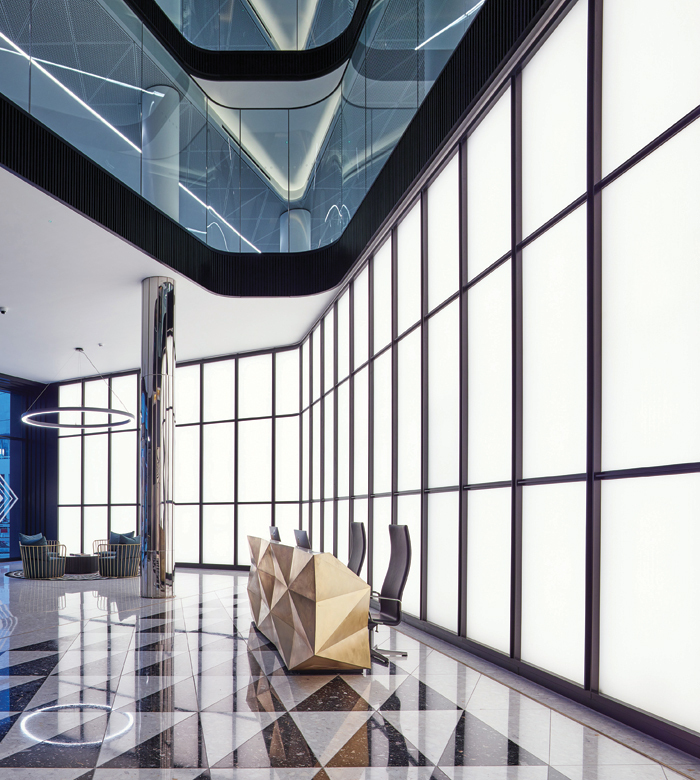 The art-moderne geometric influences – triangles, circles and hexagons – are visible throughout the lobby. Slightly fluted backlit glass walls and golden pillars brighten the reception. The art-deco influence is evident in the monochromatic palette, accents of brass on the reception desk and the floor movement joints, as well as in the signage. The design for the tenants’ board was inspired by cinema signage from the Twenties. A challenge for Orms was the height of the floors. ‘At 3m floor-to-floor it was tight and we had to have some form of air-con,’ says McRae. Localised air-handling units were distributed around each floor, supplying the tempered air directly into the floor void. The floor was only raised 95mm, meaning crossovers had to be located elsewhere. The real height of the floors is 2.6m, just below British Council for Offices’ recommendation of 2.7m. That is also why Orms opted for uplighting, with extruded aluminium lighting strips designed using 3D printing and regulatable. Corridors with stairs are covered in chevron-patterned Bolon carpet with brass rims. Stained timber doors lead to toilets that feature backlit mirrors, glazed black-tiled walls, chrome fittings and hexagon marble floors and back walls. ‘We were trying to avoid down-lighting wherever we could,’ adds McRae. Orms also created a new roof terrace for the building, working with landscape architect Robert Myers. 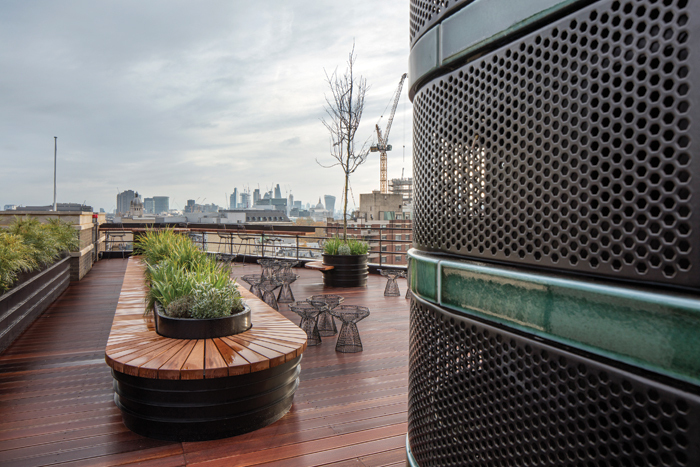 Strips of the green glazed tiles along with hexagonal black metal grilles are used for the curved roof terrace screenings. Although they have a contemporary feel, a barrel-shaped bar, metal chairs and tables, curved benching and plant pots with long horizontal lines with deep grooves echo art-moderne themes. The basement floor has storage and recycling areas as well as showers. With glazed black-tiled walls and chevron-tiled floors, the shower areas and changing rooms maintain the same level of sophistication as the rest of the building. Large cycle storage racks are positioned underneath lighting strips forming a triangle and mirroring the atrium directly above.